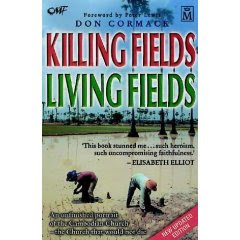 Killing Fields, Living Fields: An unfinished portrait of the Cambodian Church--the Church that would not die is written by former Cambodian missionary, Don Cormack and, with gardening and farming imagery, is the sometimes dry and sometimes riveting history of Protestant Christianity in Cambodia, beginning in 1923 with the first converts and continuing until the time the book was written in 1998. The communist Khmer Rouge took control of the government in 1975 and began to systematically torture and kill so many of their fellow countrymen that the entire country became one large concentration camp. People were killed for no reason and for every reason, their bodies left in mass graves. By 1995, 8,000 mass graves had been found with the expectation of finding as many as 20,000. Cambodia became known as the Killing Fields. What happened to the Church during the brutal rule of the Khmer Rouge? I enjoyed the book because, while there are many books and articles about Cambodia, there is little written about God’s people there and how they endured.